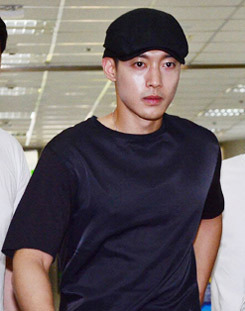 Prosecutors have charged the ex-girlfriend of singer-actor Kim Hyun-joong with attempted fraud and defamation. The woman, surnamed Choi, is accused of fabricating text messages she exchanged with the actor and claiming that she had a miscarriage after he assaulted her. Choi sued Kim for W1.6 billion in May of 2014, claiming that he kicked her in the abdomen while she was pregnant, which resulted in a miscarriage, and tried several times to force her to have an abortion, resulting in psychological trauma (US$1=W1,167). Kim countersued, saying Choi breached a confidentiality agreement after a W600 million payoff and damaged his reputation by spreading lies about their relationship. A court ruled in August last year Choi must pay Kim W100 million in damages. Kim also brought criminal charges against Choi in June of last year accusing her of intimidation and extortion, but prosecutors did not find enough evidence. Kim then turned to a higher prosecutors' office, which decided to indict the woman.